The Islamic collection of over 20,000 items is being presented in an important 27-volume series, of which 17 are now published, and when completed will form a unique survey of the field to date. The entire Islamic publication is being edited by Dr Julian Raby, previously a lecturer at Oxford University and currently Director of the Freer Gallery of Art and Arthur M Sackler Gallery, Smithsonian Institution, Washington D.C. Under Khalili’s leadership, the most eminent academics in each field from major museums and institutions around the world have been commissioned to write the volumes. Among them are Professor Michael Rogers, former Curator of the Islamic Department at the British Museum, London, first holder of The Khalili Chair of Islamic Art at the School of Oriental and African Studies, University of London, and currently the Honorary Curator of the Khalili Collection. Professor Rogers is also one of the four scholars of Islamic art who are members of The British Academy. Qur’ans produced in the period after 1600 are included in this fourth volume, which will be published in two parts, each containing entries on some 75 fine examples. JAMES (David), After Timur : Qur’ans of the 15th and 16th centuries, Londres, Azimuth ed., ("The Nasser D. Khalili collection of Islamic art. ; 3")1992, 256 p. ISBN 0-19-727602-4. The third volume of the catalogue of Qur’anic material covers the period from 1400 to 1600, and presents 60 items from Iran, Central Asia, Syria, Egypt, Turkey and India. 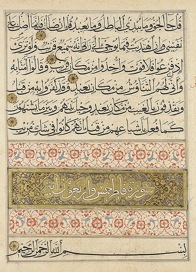 JAMES (David), The master scribes : Qur’ans of the 10th to 14th centuries AD, Londres, Azimuth ed, ("The Nasser D. Khalili collection of Islamic art. ; 2"), 1992, 240 p. ISBN 0-19-727601-6. This, the second of the four-volume catalogue of the Qur’anic material in the Collection, covers the period from AD 1000 to 1400 and includes examples from Iraq, Iran, Syria, Egypt, Anatolia, India, Spain and North Africa.